The New Jersey Vietnam Veterans’ Memorial Foundation offers a meaningful and engaging experience that recognizes the sacrifices, courage, and valor of Vietnam Veterans and that encourages and fosters a thorough understanding of the Vietnam Era including the political, historical, social, cultural, and military aspects, which affected the United States and especially New Jersey. The New Jersey Vietnam Veterans‘ Memorial and the Vietnam Era Museum & Educational Center are located within sight of each other near the PNC Bank Arts Center in Holmdel, NJ. The Memorial brings to New Jersey a fitting acknowledgment of the valor displayed by the New Jersey residents who never returned from Southeast Asia. It commemorates the courage shown by all who served in America‘s armed forces during the years of the Vietnam conflict. Its companion project, the Vietnam Era Museum & Educational Center, provides a means to present factual and unbiased information about the era. Using exhibits, audio/visual presentations, structured programs and guest speakers, visitors are provided with a forum for ongoing discussion and an opportunity to gain a better understanding of America‘s most divisive period since the Civil War. Supplemental programs, such as veterans‘ biographies, are intended to recognize and document the contributions made by New Jersey‘s veterans so that their service to our nation will be preserved for future generations. A group of veterans from New Jersey attending the dedication of the national Vietnam Veterans Memorial in Washington, DC, in 1982 saw the power of the memorial honoring those who never returned. Over the next three years, these veterans worked with state legislators, veterans groups, community groups and individuals to generate support for a tribute to all New Jerseyans who served during the Vietnam War. This grassroots effort, led by William Caubet, State Senator Edward T. O‘Connor, Jr., and others was the impetus for the building of the New Jersey Vietnam Veterans‘ Memorial in our state. On January 12, 1986, Governor Thomas Kean signed the bill creating the 14-member New Jersey Vietnam Veterans‘ Memorial Committee within the Department of State. Senator Edward O‘Connor, the first Vietnam Veteran elected to the state senate, was selected to serve as chairman. The committee‘s charge was threefold: select an appropriate site, select an appropriate design, and raise the funds to complete the construction. The first action taken was to determine a proper location for the Memorial. The committee selected a 5.5-acre site on the grounds of the PNC Bank Arts Center (formerly the Garden State Arts Center) in Holmdel Township, Monmouth County, from six possible sites across New Jersey including Liberty State Park and Trenton. The decision was based on the rolling hills in this area that provide the serenity and tranquility appropriate for a Memorial to those who had given their lives for our country. In July 1986, dedication ceremonies were held at the site. The next step was to choose a design for the Memorial. Governor Kean signed legislation in June 1987 appropriating $25,000 to administer a statewide competition for the design of the memorial. The memorial design competition ran through the summer of 1988 and drew 421 entries. A select panel of experts from New Jersey’s art, cultural, historical, and veteran’s communities chose the memorial design. On July 7, 1988, the winning design for the memorial, submitted by Hien Nguyen (a naturalized American citizen who had escaped from Vietnam thirteen years earlier), was unveiled during ceremonies at the site. Nguyen‘s design is a 200-foot diameter, open-air pavilion, lined with 366 black granite panels on which the names of those who died or remain missing in action are engraved. The pavilion contains many symbols. Its circular form enfolds the names engraved upon the wall in its embrace. The highly polished granite wall reflects the visitor, creating a special and unique union. The tunnel entrances symbolize the transition from the safety and security of our world to the very different realities of war. The trees lining the walkways to the entrance evoke images of soldiers on tactical road patrol throughout the dangerous countryside. At the center of the pavilion, our official state tree, the red oak, symbolizes the state that many soldiers left and never returned to. The tree gives shade to the returning veterans, sheltering them, while at the same time leaves them exposed to other elements. Groundbreaking ceremonies were held at the site on May 7, 1989, with Governor Thomas Kean, veterans’ groups, family members, and state and local officials in attendance. The start of construction would wait two-and-a-half years until sufficient funds were raised for the initial phase of the memorial‘s construction. From May 13 through May 27, 1989, 14 Vietnam Veterans from New Jersey walked 237 miles from the Vietnam Veterans Memorial in Washington to the future site of the New Jersey memorial in Holmdel. This “Last Patrol” honored those who did not return and raised public awareness about New Jersey‘s planned memorial. During this time, the New Jersey Vietnam Veterans‘ Memorial Foundation was created and incorporated under the laws of the State of New Jersey as a non-profit corporation. The memorial committee continued in an oversight capacity, relying on the foundation‘s officers, trustees, executive director, and volunteers to pursue the day-to-day needs of the individual elements of the project. The New Jersey Vietnam Veterans‘ Memorial Committee was also transferred from the Department of State to the newly created Department of Military and Veterans Affairs. In December 1990, Governor Jim Florio signed legislation to increase the committee to 24 members and appointed 10 new members. New to the committee were Anthony Dellanno and Louis A. Vlahakes. These two Vietnam Veterans, along with assistance from the Utility and Transportation Contractors Association, recruited construction firms, architectural and engineering firms, landscaping companies and labor unions throughout the state to provide over $1.5 million in donated services, materials and labor. Also new to the Commission was Henry Rossi, another Vietnam Veteran, who assumed responsibility for all the grassroots fundraising throughout the state. 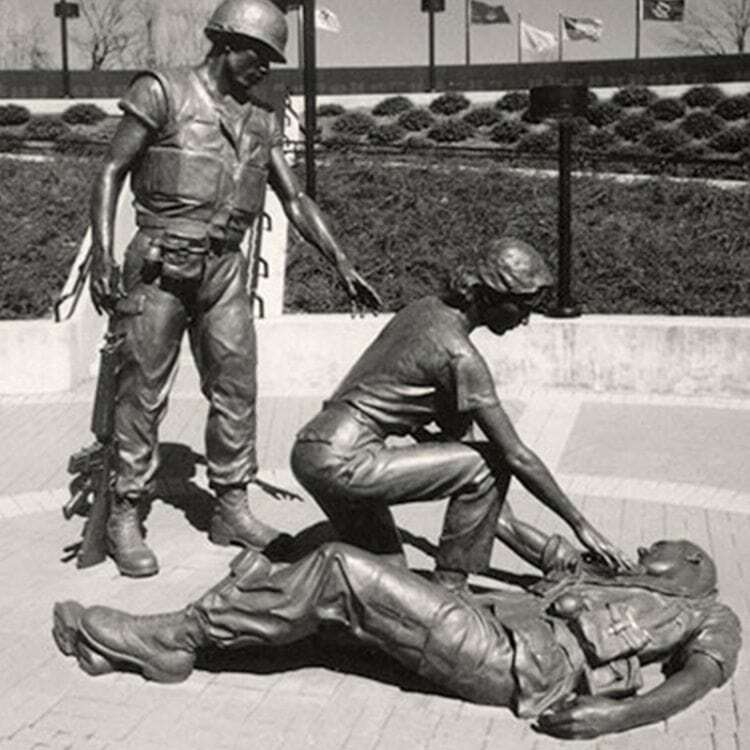 As a result of the increasing awareness of the Memorial, legislation was passed on April 16, 1991 to designate May 7th each year as New Jersey Vietnam Veterans‘ Remembrance Day. The committee requested a proclamation from the Governor‘s Office and encouraged other statewide observances. The first annual observance of Vietnam Veterans‘ Remembrance Day was held at the Memorial site with a wreath laying ceremony. Later that day, ceremonies were held at Liberty State Park. The fundraising momentum had been slowly building through the years but needed a helping hand from New Jersey‘s corporate community. In 1990, Governor Florio asked Robert P. Luciano, then chairman and CEO of Schering-Plough Corporation, to lead the corporate fundraising effort. Through his efforts and a generous contribution of $1 million from Caesars Atlantic City, the first phase of construction began in November 1991. Governor Jim Florio presided over the event at which veterans and family members witnessed the first stage of construction. 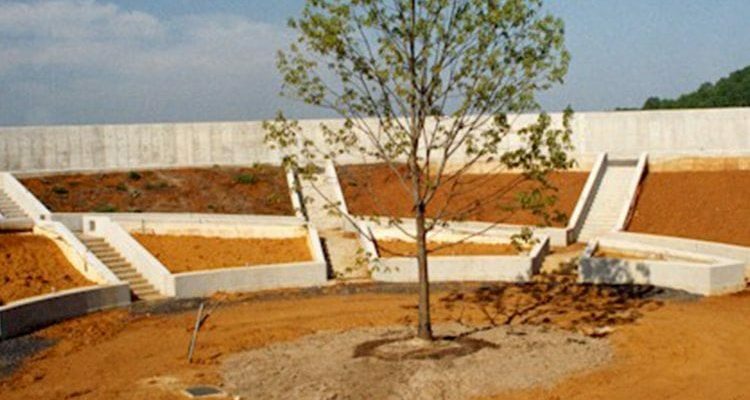 This phase saw the excavation of thousands of cubic yards of earth, the pouring of thousands of cubic yards of concrete for the Memorial‘s foundation, inner structure and the outer ring wall, and the start of initial landscaping activity. This phase continued through 1992 and into the winter of 1993. To further bolster fundraising, additional pieces of legislation were passed to allow counties and municipalities to annually appropriate funds in support of the Memorial. The Legislature also placed the Memorial Fund on New Jersey‘s state income tax form. Residents can now direct a portion of their tax refund to the Memorial. Legislation also established Charity Day at the Races, so a portion of the proceeds at each of the state‘s eight racetracks would be given to the Memorial. In February 1990, designs for the three statues were solicited from New Jersey sculptors and an impartial committee composed of members from the veterans, arts, cultural, and historical communities judged the designs submitted. Trenton sculptor Thomas Jay Warren‘s design was selected. Warren not only created an impressive and magnificent work, but he gave the three heroic figures souls. The three bronze figures under the red oak tree represent men and women of all races and backgrounds – symbolizing those who came home, the women who served and, those who did not return. The New Jersey State Elks agreed to raise the funds needed for the statue, totaling $187,000. The Elks became an integral part of the grassroots fundraising effort. By the spring of 1993, preliminary plans for the Memorial‘s companion project, the Vietnam Era Educational Center, began as a result of the call for an educational component by veterans, students, and teachers in the state. Visits to other state memorials, as well as the national memorial, demonstrated the need to teach children about the Vietnam Era. Regular meetings of the Foundation‘s Educational Center Planning Committee, New Jersey historians, veterans, museum professionals, and educators continued through February 1994. 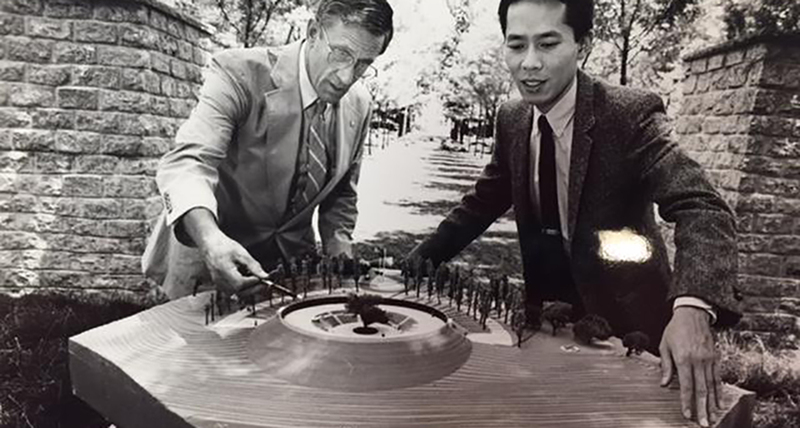 In April 1994, a master plan was presented and served as the first step in the development of the Center. From this master plan, details developed defining the center‘s internal layout, display and audio/visual content and supporting programs. When the Memorial structure was completed, the Foundation began work on the Educational Center. When Governor Christine Todd Whitman took office in 1994, the Memorial truly gained a supporter. Her inaugural committee made a $25,000 donation that was greatly needed. Fundraising for the project had been difficult and the committee was unsure how to obtain the $1.2 million needed to complete construction of the Memorial. John Whitman, a Vietnam Veteran himself, stepped forward to help the cause. At a meeting in September 1994, Governor Whitman announced her support for the project and named her husband and Lawrence R. Codey, then president and COO of Public Service Electric and Gas Company, to head up the final fundraising push for the Memorial. Codey, also a Vietnam Veteran, and John Whitman quickly put together a committee of business leaders who in six short weeks came up with the funds needed to complete the Memorial. The plan was to dedicate the Memorial on May 7, 1995, to coincide with the 20th anniversary of the end of the Vietnam War. In February 1995, the Foundation received more good news when the casino industry agreed to fund the Vietnam Era Educational Center. Each of the 11 casinos donated $250,000, through the Casino Reinvestment Development Authority. In 1995, the Foundation began working with Meredith Lair, a graduate student, who would write an outline for the story that would be told in the exhibit. A committee of historians, educators, museum professionals, and veterans worked with Lair. In 1996, the Foundation hired Ralph Appelbaum and Associates to design the museum, after putting out a bid for design services and design proposals. RAA is world renown for its work on the United States Holocaust Memorial Museum. The RAA team worked with Lair and the committee to begin turning words on paper into a unique three-dimensional experience. When a first draft of the exhibit script was given to the Board in September 1997, the veterans‘ community responded with displeasure. They felt that the story did not portray them in a positive light and did not tell a balanced story of the war. The initial committee was expanded to include more veterans. The committee began the long and arduous process of reviewing the exhibit script sentence-by-sentence. The committee would work for 8 months on the script that would guide the entire design and layout of the exhibit area. As the exhibit script was being revised, plans for the building were also changing. RAA suggested a new design for the building, which the Board agreed with. However, the design was limited by the funds available to complete the project. A series of changes were made and construction finally began on the Educational Center. On September 27, 1998, Governor Christine Todd Whitman, John Whitman and U.S. Senator John McCain of Arizona, a former POW who spent over 5 years in the Hanoi Hilton, joined a large crowd to dedicate the Vietnam Era Educational Center. 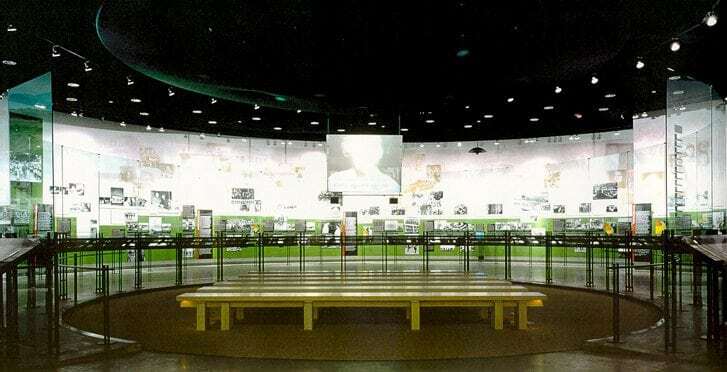 The Vietnam Era Museum & Educational Center enables visitors to attain a greater understanding of the myriad of forces that produced the conflict abroad and the dissension at home. It provides an atmosphere where appropriate materials and exhibits help visitors understand the significance of the Memorial, the reality of the conflict, and the social, political and cultural complexities of the war years. It complements the solemnity of the Memorial.